The award is based on a sustained record of service over a period of years carried out through the individual’s role(s) in the University rather than as a private citizen. This award is intended to publicly recognize exemplary ideas that, when implemented, will serve to further the USM’s goal to continually increase the effective and efficient use of its resources. One award from the listed categories may be made for an exemplary initiative that has the potential to be implemented system-wide. Administrative Transformation: Improved Effectiveness and efficiency resulting in a minimum cost savings of $10,000. In most categories, two awards will be given - one for an exempt employee and one for a non-exempt employee. In the Effectiveness and Efficiency category, the award can be given to two employees of the same classification. Each awardee will receive a $2,000 stipend and a commemorative plaque. Any employee or student may nominate an employee (with the knowledge and consent of the nominee). Employees may also nominate themselves. The nominee must be a Regular or Contingent II status employee at UMD. 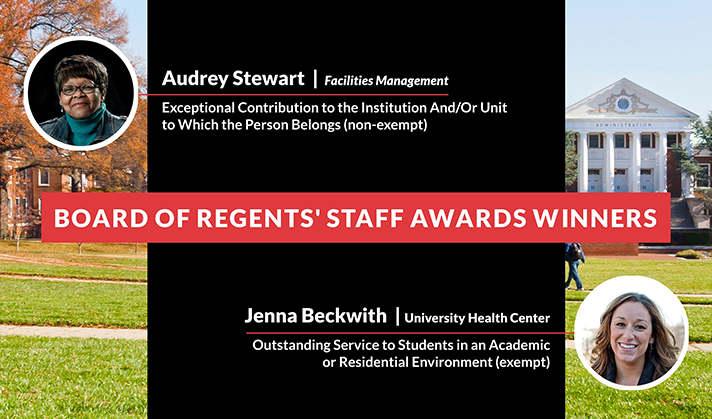 The nominee must have been employed at UMD for at least five consecutive years. Consideration will be given to sustained performance which occurred during the past five consecutive years. CEO's (Chancellor and Presidents), officers, and senior leadership are not eligible. The senior leadership at this University consists of the President's direct reports (including the Director of Athletics), all VPs and their direct reports, all Deans, and the Chief of Police. A nomination package must be generated by the nominator that includes the following documents, organized in the order listed below. The packet instructions and forms are available below. Nomination Cover Sheet: a cover sheet must be completed and signed. Please note, nominators are not required to include the President's endorsement letter; this will be generated separately for finalists. Nomination Letter: a signed letter must accompany each nominee's package. State the category for which the staff employee is being nominated and give testimony of exemplary performance in that category. Please limit to two pages. Examples of successful nomination letters are available on request. Please limit to two pages. Position Description: position descriptions must include the purpose of the position and list specific job duties in detail. Please provide all information using the form linked below (no resumes). The position description must be signed by the employee's supervisor. Letters of Recommendation: include three one-page letters of recommendation that discuss what makes this individual exceptional in the award category. Both external and internal recommendations are welcome; letters should include the writer's contact information. Letters must be in support of the candidate's activities as they relate to the category for which s/he is being nominated. Please limit each letter to one page. Optional Supporting Materials: any additional materials (e.g., articles, awards, recognitions) that the nominee feels reflect relevant accomplishments. Material should be current (from the past five years) and no more than five pages in length. Please send completed packets to Aaron Tobiason (tobiason@umd.edu). If you would like guidance as you compile your packet, Aaron can assist with that, as well. The Senate Staff Affairs Committee will collect submissions, fully consider all nominees, and make final recommendations to the President in January 2019. Finalists (nominators and/or nominees) will be invited to meet with a member of the President's Office in order to develop a letter of endorsement from the President, which will accompany all final packages. The President will select and forward the final campus nominees to the USM. The USM's staff awards committee will review nomination packages and submit recommendations for awards to the BOR. 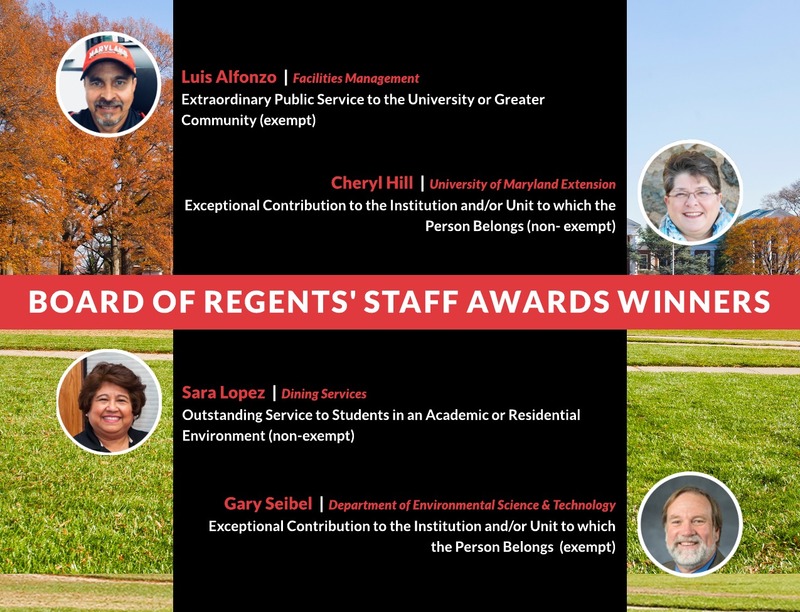 Recipients will be announced in July 2019 with a formal presentation of the award by the BOR in fall 2019.